It took me a looong time to get into this book. I liked the world and all the details but I wasn’t immediately amazed. Only about halfway through, I started feeling invested. In short, this is the story of a girl who is stuck between two sides, the dragons and the humans. There has been a peace treaty for years but there are groups on both sides who want that treaty to fail. Seraphina works as a music mistress in the palace, she is super talented but she doesn’t have any friends because she has a secret no one can ever know about. She doesn’t let anyone close enough to figure it out. Even though it took me some time to find my way, by the time I finished this book I didn’t want it to end. Just because I felt like the story had only just begun, like over half of the book was just introduction and then when it got interesting, it was suddenly over. I felt a bit cheated. I must say that Rachel Hartman is a master of detail. She created a world with different languages, different countries and a law system to accompany the peace treaty. I respect that, it must have taken a lot of hard work and a lot of creativity. Also, she fooled me completely. I’m not usually fooled but this time she arranged the background so beautifully that I fell for it. If you read this book, you will know what I’m talking about. I don’t want to spoil it for you. I was torn between 3 or 4 stars. I loved the end of the book but I needed more. That’s why I hope there will be a sequel soon. There is so much left to write about, it would be a shame to let it go to waste. Building a whole world like that and then not explore it. I wanted more of the romance, I wanted more of the conflict and the possible characters who, in the end, didn’t get a voice. So for now, I’ll give this book 3 stars, not because it was a bad book but because I was disappointed by the amount of story we got. Information and story should be balanced carefully and that wasn’t the case here, unfortunately. If you like fantasy books, you probably already read this. If you haven’t, then I do recommend it. I’m sure this series (if it is going to be a series) will only get better!! UPDATE: Just found out that the sequel is now available! More information about Shadow Scale can be found here. I will not change this review because it honestly reflects my thoughts after reading this book. 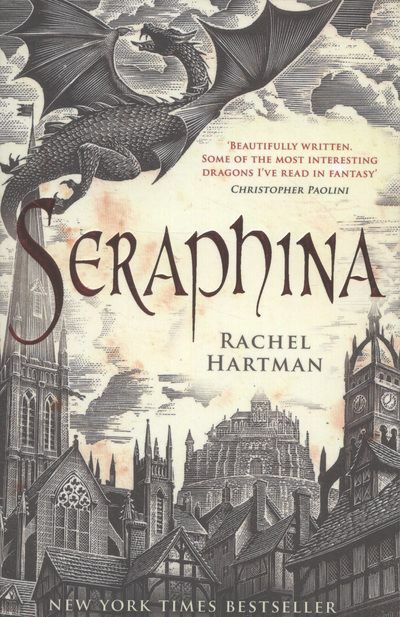 Did you read Seraphina and if you did, did you like it? Or maybe more importantly did you read Shadow Scale and is it good? Buy? Take a look here.